New to Prestashop? Looking for free themes for your new online store? If so, you’re in the right place to pick up one of the best layout design for your site. In this post, you’ll find a great collection of 22 free Prestashop themes for any type of eCommerce websites such as apparel, fashion, clothing online store, gadget, computers and furniture shop you can download for free. As we know, PrestaShop is one of the most popular open source e-commerce shopping cart that allow you to create professional online shop with a great ability and features such as multi payment support, easy to use, multi-language, stock and Multistore management. The best part is you can join the community trough official Prestashop forum, you will find a lot of great resources, tutorial, ask question to other members and download new modules / prestahop themes. Nowadays, responsive design is must-have features to make your online shop flexible to the mobile device screen, make the user feel comfortable when browsing your product pages, so that the average level of sales could be more effective. Some prestashop themes listed in this post also have a responsive design features, you can find the information on the description of each theme. 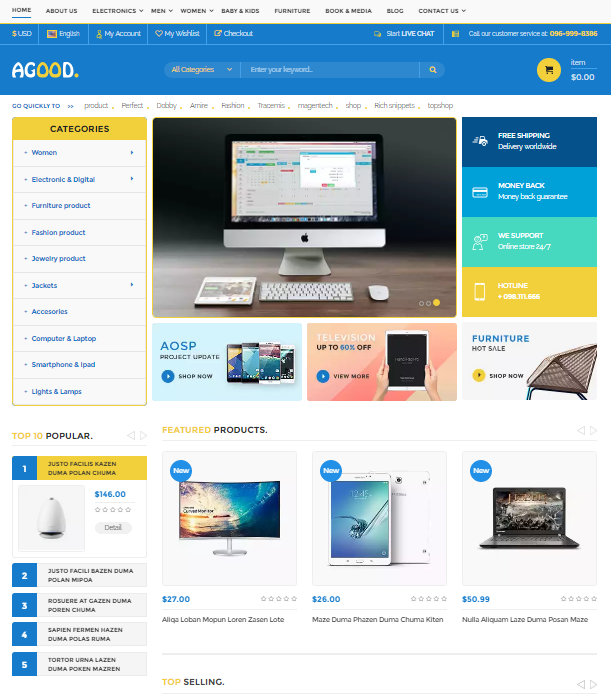 Agood is an unique and modern Prestashop theme for your digital store. This gorgeous theme is integrated with lots of awesome features Mega Menu, RTL Language, etc. You are free to control this theme in order to make your store more friendly and adorable for your customers. It’s two column fashion Prestashop related theme with front banner with features product. This totally free to use. Currenty it is in black color theme. Clothes is unique, bold and simple free theme for Prestashop that you can use for women and fashion eCommerce sites. Leo Converse is a great prestashop theme for online Fashion Shop, Shoes Shop, clothes Shop, etc. It is free and 100% responsive design so it looks great not only in Destop, but also in Mobile and Tablet. Clean and Simple Blue Theme is a Prestashop 1.5 theme designed by Free Presta Themes. This theme have blue navigation bar with nice style. We have made some modifications in design of blocks and home-featured. This responsive PrestaShop free sample was created to ruin your last doubts and simplify your future work as you get a perfect possibility to practise it before starting your project online. 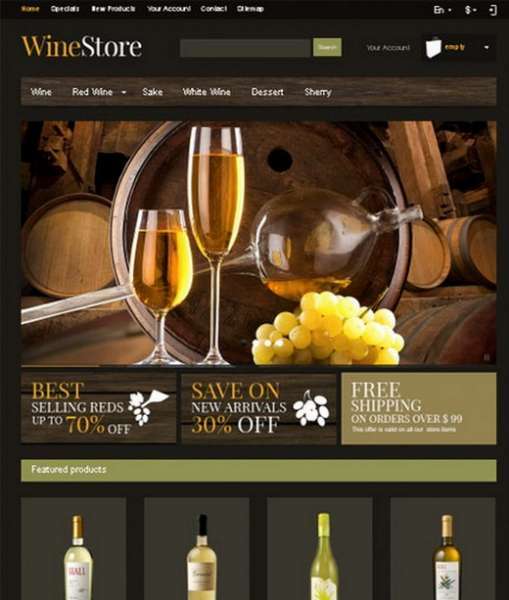 A clean and free prestashop theme with yellow and white color scheme, 3 column right and left sidebar and image slider. Leo Sport Shoes is an amazing Free responsive theme for your Prestashop Store. Based on Leo Framework – a powerful responsive Prestashop framework, This template is a totally responsive design. this is unique project that uses the power of LESScss in order to make the Prestashop Default theme customizable and good looking. 2 or 3 column layout – super easy switching, 8 Background patterns, Css3 buttons, Logo PSD file included. Another clean and elegant theme made for Prestashop designed by only 1 column. The homefeatured show only 4 products per line. Free apparel theme is Responsive design Prestashop theme with Custom horizontal menu module. The main topic is apparel and clothing, but it’s also suitable for any other webshop. OT Valupat is designed free theme for any technical store website and now available for Prestashop. With its clean design and lot of features, you will have a very profitable online shop in no time and no fee. If we need a design for an online mobile shop this is what we were looking for. It is a two-tone design in black and gray with 2 columns. This template is a mini fashion and urban product store, based on 3 verticals layout. It’s a new reloaded version of Ipnotik template. Black Hawk is a free template for Prestashop designed structured in 1 column. The products from home featured are showed in 4 columns per line. This Prestashop template is responsive, so can be used in different devices as PC, notebook, tablets and phones. Simple Responsive Theme for PrestaShopis based on the responsive front-end framework : Foundation from ZURB. The theme is based on 2 columns, it’s a clear theme with simple colors for an easy and quickly customization. This template is just a concept store, to demonstrate how much Prestashop e-commerce CMS is flexible to make a clean up layout. OT Jewelry is now available for Prestashop with its clean design and a lot of features. It is Validates with XHTML and designed for any jewelry online store. Moon template is another concept store for Prestashop CMS, with a simple and purified design. So feel free to use it as a basis in your future ecommerce project. Let us know which Free Prestashop Theme is your favorite in the comments section below.